On my second full day in New York City, my family decided to wander around Central Park and visit the American Museum of Natural History. As a light rain began to fall and we all started to hit a wall we decided that it was an ideal time to pick a lunch spot. After doing a quick Find Me Gluten Free search, I found Cafe Frida, which was located a block away from the museum- which was super convenient. 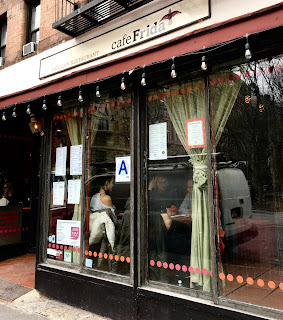 Mexican food is reliably safe gluten-free-wise, so that knowledge combined with good reviews made me confident that Cafe Frida would be a great place to grab lunch. 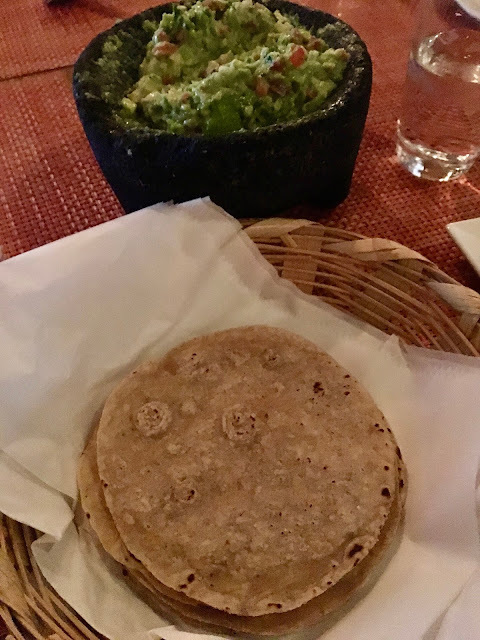 What is awesome about Cafe Frida is that they place an emphasis on curating authentic Mexican flavors on their menu- this isn't a stereotypical Americanized Mexican eatery. Using real food made from scratch every day, it was clear to me that Cafe Frida was a great find on the fly. Most of Cafe Frida's offerings can be made gluten-free, but there are some areas to avoid if you are celiac or highly sensitive. They do not have a dedicated fryer so if you get salsa or guacamole as a starter you have to request fresh corn tortillas for dipping. My waiter was able to point me to dishes that would be safe because the menus are not marked to indicate gluten-free options. Vegans take note- Cafe Frida does provide a vegan menu with allergens marked. As a starter, my family decided upon the guacamole with chips for them, tortillas for me. The guacamole was a true standout, and was chunky- loaded with tomatoes and red onion. It was limey- just the way I like it, and the avocado was mashed to a creamy, spreadable consistency. It was irresistible and easily ate all the tortillas and half the portion of guacamole. For an entree, I ordered the chicken tacos, which are dairy-free. The slow-roasted, pulled chicken was succulent and tender, absolutely satisfying. It was covered in a spicy-citrusy sauce that was complex and multidimensional in flavor. Pickled onions provided a crunchy contrasting texture and a complementary flavor. Each taco was generously served the chicken-onion mixture which made it hard to eat the tacos without the topping dripping out, but I had no complaints. 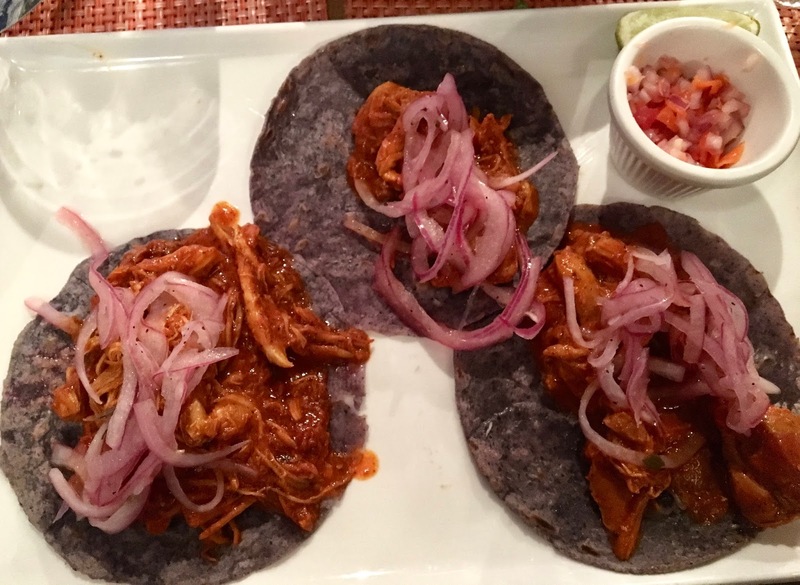 The blue corn soft tacos were sturdy and proved capable of holding the abundance of toppings. The accompanying garnish packed a big punch in the heat department so I did not eat it on my tacos- but altogether they were satisfying and impressive. For finding it on a whim, Cafe Frida really impressed me with their delicious fare and clearly intentional preparation. The food was crafted care, and was really satisfying and delicious. It proved once again that New York City is overflowing with incredible eateries from around the world. If you find yourself in the Upper West Side, do yourself a favor and plan to stop for a meal at Cafe Frida.